Two physical features, among others, make humans unique: our way of walking and running upright on two legs, and our newborn babies’ very large heads. Those two traits of humanity meet at the pelvis, a set of bones that includes the ilium, ischium, pubis, and sacrum. For more than 50 years, anthropologists thought that the human pelvis was shaped by an evolutionary tug-of-war between the competing demands of bipedalism and childbirth. Now, a team of scientists that includes Kristi Lewton, an assistant professor in the department of anatomy and neurobiology at Boston University School of Medicine, has shown that this so-called “obstetric dilemma” might not be a dilemma at all. Humans give birth to very large—”ginormous!”—newborns, says Lewton. While chimps and other nonhuman primate babies emerge from the birth canal with room to spare, human infants must perform a complicated series of rotations to make their way into the world, and the pelvic opening is just barely big enough. If something goes wrong, the lives of both mother and baby are at risk. So, why hasn’t the human body evolved a wider pelvis? Anthropologists have long believed that an evolutionary trade-off was at work; they assumed that a wide pelvis was “bad for bipedalism,” says Lewton. Yet, until now, no one had rigorously tested this assumption. Lewton and her colleagues set out to discover whether wide hips really do make running and walking less efficient. They recruited 38 undergraduates, including both men and women, and had them walk and run on a treadmill while gauging how hard they were working by measuring their oxygen consumption. While the participants exercised, eight cameras trained on infrared markers attached to the participants’ hips, knees, ankles, thighs, and shanks tracked their motion. If the basic assumptions of the obstetric dilemma are right, says Lewton, participants with wider hips should run and walk less efficiently than those with narrow ones. But that wasn’t what Lewton and her team found. Instead, they found no connection at all between hip width and efficiency: wide-hipped runners moved just as well as their narrow-hipped peers. Lewton and her colleagues report their results in PLOS ONE. That should make bipeds of all shapes and sizes feel good. But it leaves a question: if the demands of locomotion aren’t holding them back, why haven’t human hips gotten wider over generations of evolution—and why hasn’t childbirth gotten any easier? Perhaps a third, still-unknown evolutionary force is at work. Or maybe, Lewton suggests, human childbirth hasn’t always been so hard. Some researchers believe a dramatic change happened about 10,000 years ago, when Neolithic humans made the switch from foraging to farming. Comparing skeletons from before and after this transition, anthropologists have found that the bones and teeth of people who lived on an agricultural diet, with lots of grain and relatively little protein, were relatively weak. Anthropologists also think that widespread vitamin D deficiencies appeared around this time, as recorded in malformations of the pelvic bones. If babies got dramatically bigger at the time of this agricultural transition, we might not yet see the impact of evolution on the body. To understand the forces that have shaped the pelvis over time, Lewton is also looking to our primate relatives, from tiny pygmy marmosets all the way up to hulking 220-pound gorillas. Over the course of half a year, Lewton traveled to seven museums around the world, examining skeletons from 800 individual animals representing 40 different primate species. Her collection included four different “locomotor groups”: humans; animals that spend most of their time in trees; “terrestrial quadrupeds” that walk on four legs on the ground; and, most dramatically, “vertical clingers and leapers,” which generate huge propulsive forces as they perform their acrobatics. Using a simple mechanical model in which the bones of the pelvis are treated as rigid levers, Lewton made a series of predictions about how the pelvic bones should vary across the four groups. But of the nine different features she analyzed, only two—the height and strength of the lower part of the ilium—matched her predictions. “What this suggests to me is that the model that we derived these predictions from is not quite right,” says Lewton. 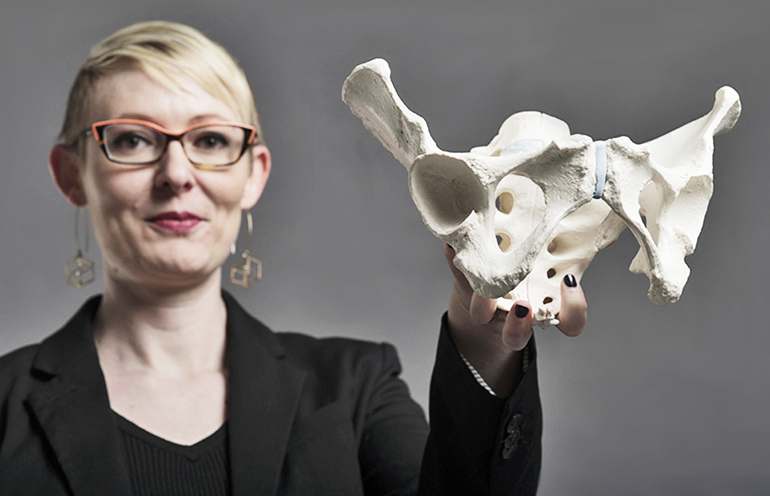 She is now developing more detailed models of the pelvis that will enable her to gauge directly the stresses and strains on the bones. Grants from the National Science Foundation and the Leakey Foundation supported the work.